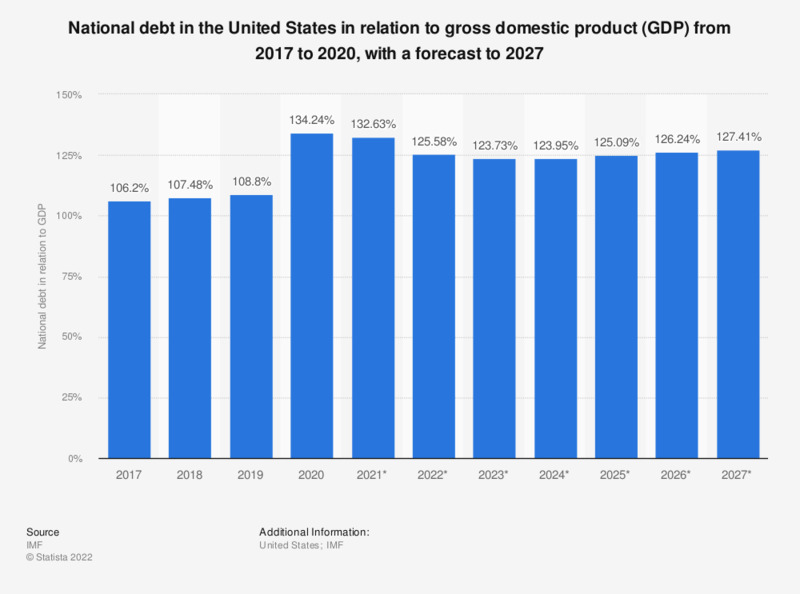 The statistic shows the national debt of the United States from 2012 to 2017 in relation to the gross domestic product (GDP), with projections up until 2022. In 2017, the national debt of the United States was at around 105.2 percent of the gross domestic product. See the US GDP for further information. There has been a dramatic increase in the public debt of the United States since 1990, although the month-to-month change has been quite stable over the last few months. Public debt is defined as the amount of money borrowed by a country to cover budget deficits. A ranking of individual state debt in the United States shows that California is leading by a clear margin, with more than double the amount of runner-up New York. Vermont, North Dakota and South Dakota are the states with the lowest amount of debt. Even before the recession of 2008, the national debt of the United States had been increasing steadily and excessively, and it is predicted to rise even further. Budget cuts and fewer job opportunities as a result of the crisis are taking their toll on the American economy, which is still recovering. Trade figures as well as unemployment are still below average. Subsequently, the national debt and the national debt of the United States per capita have more or less quadrupled since the 1990s. Interestingly, the United States is not even among the top ten of countries with the highest public debt in relation to gross domestic product in international comparison. Japan, Greece and Italy – among others – report far higher figures than the United States. The data have been rounded to provide better understanding of the statistic.